"ADOBK" stands for Adjustable, Double leg, Oblong master link & BK is a self-closing safety hook. 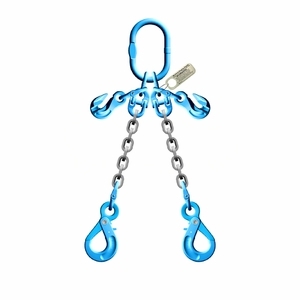 These Grade 120 chain slings feature an oblong master link on one end and two self-closing safety hooks on the other end. Self-closing hooks offer a wider throat opening and a rugged alloy latch that holds up better than the latch on a standard sling hook.